Thought I'd knock together a little example of using Waterlock/SailsJs with EmberJs and using JWT as the mechanism. Client provides access_token in future requests. While this may look a lot like the standard cookies session ID flow there is a major difference in that a JWT is a small encrypted package which defines the access claim and identifies the user. They are inherently much more secure than cookies as well as allowing statelessness - and this is the big one. Yeah sure we can manage session state across servers in a cluster using a central cache like Redis. Go ahead, hope you have a nice day breaking the fundamental design of the web. Using these two projects in tandem makes it ridiculously easy to get up and running with JWT and a decent REST API. Couple that with EmberJs - "a framework for ambitious web applications" and you have a pretty niffty set-up. So that's the server side and UI components. I'm not going to go through setting up each of these components - you can see how that's all done on each of their repos. I'm also asuming that if you're interested in this little cocktail of code you're probably aware of each of them but a little confused as to how you go about pinning it all together. So down to the code! The repo is here: https://github.com/wayne-o/ember-waterlock-example go ahead and clone it if that's what flicks your switch - I expect it does else you wouldn't have read this far. I'll walk us through the interesting parts of the server initially - there's not much to it! I've added a couple of extras here that help make things simple. Ember-Data is a brilliant little library - it doesn't do everything and I don't use it everywhere but where it is used it's very clever and ahead of it's time. One of those areas is being a pretty complete implementation of the JSON-API spec: http://jsonapi.org/. And to get SailsJs dancing nicely with this spec we need to update the blueprints. To do this I use the brilliant repo by mphasize: https://github.com/mphasize/sails-ember-blueprints. What this does is turn the standard JSON output from sails into nice neat JSON API compatible JSON. Neat. You can see that I've added the "associations" and "validations" nodes to the config. It just defines explicitly how you want these types of nodes to appear in the JSON output. You're going to need to tell it to pluralizeEndpoints and also you need to rename the token name - ember-simple-auth expects "access_token" - don't do this and you're into a world of pain. You also want to set "stateless" to false - we don't want any nasty sessions on the server thank you please. Sessions are grotty at the best of time and mess with your head when you try and step up in the scalability realm. JWT is stateless authentication. It keeps things clean. That's it for the API! Simple yeah. So now onto the client - this is where things can get a little... involved. But considering what you're getting - I'd say not too involved. You'll want to cd into the /sonatribe-ui folder and do the usual npm install && bower install stuff. Go with my defaults for now - you can mess with these later if you want. 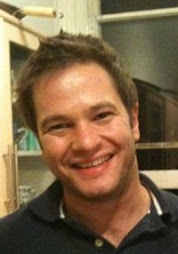 I've used pod structure - it's great for organising an app small or large. The only noteworthy thing being the slightly different flow for registering as opposed to loging in - waterlock (currently) uses the same workflow and if an un-registered user attempts to login and "createOnNotFound" (https://github.com/wayne-o/ember-waterlock-example/blob/master/sonatribe-api/config/waterlock.js#L48) is true, waterlock assumes you want to create a new users - and provided the dupe checking passes (no duplicate username/email validations) - a new user is created. In future versions of Waterlock there will be an explicit /register endpoint. For now it's best to query the /users endpoint for email / username availability. I'm doing this here: https://github.com/wayne-o/ember-waterlock-example/blob/master/sonatribe-ui/app/pods/components/register/register-panel/component.js#L10 (not wired up atm - I'll likely do that in the week to finish up). So the process is to call /login if the validations for username / email pass - get the user registered and logged in and then, using the response with our authentication data we can populate the users User model and save. Finally we push the user off to the main app by sending an action to the parent route ("userAuthenticated"). I'm aware that because I am accessing Ember-Data and JQ.Ajax within this component I am completely side stepping DDAU (http://www.samselikoff.com/blog/data-down-actions-up/) - and this is a bit cringe but I'm going to leave it as is as I want the example to be clear. The simplicity of using these libraries side by side should be unhindered! I've been refreshing my brain on threading in C# recently and have compiled a list of resources I found excellent on the subject. If you're a .NET dev interested in finding out what it's like to develop .NET apps on Ubuntu the cross over can be quite painful. I've created a vagrant box which comes loaded with the bleeding edge MonoDevelop (actually compiled from the source). Then just pull my vagrant config from the repo. It takes a while to get loaded 1st time as it builds MonoDevelop from source but it's all set up and ready to go when it's finished. Vagrant is a great tool, lots of NET developers might not have heard of it but it makes creating dev (and prod) environments super easy. We are looking into refactoring sonatribe to be an ember-cli SPA. Using the Discourse code base as inspiration I've been spiking various parts to see exactly how feasible this would be. As you can see the header is a really nice, dock-able UI and has a lot of features. My initial thoughts after looking at the code to isolate the header were that this would be near on impossible. We wanted to do this because we want the transition from sonatribe to our discourse installation to be seamless - it's important that it feels like one app. Ignoring the obvious integration points outside of UI (things like updating sonatribe or discourse when the user receives a PM - this will come later hopefully in the form of plugins). I'd never used Ember or Ruby before and so diving into the Discourse source code was a little daunting! The search API is a really poor knocked-together ServiceStack API which has zero optimizations so ignore the poor perf on the results! All well and good but I was still stubbing the preload store. This is where Discourse have done the clever thing of loading the app with all of the data it needs to render itself on boot. Looking at the Discourse HTML you can see there is a lot of JS/JSON injected in. The problem here is that ember-cli doesn't really work this way. Ember-cli gives you the folder structure to develop in and uses a filesystem watcher to recompile your code (ES6, SCSS etc) into a distributable form. It even serves the index.html inside a HTTP server for you. Discourse works this way because the SPA knows you're logged in through the presence of a user object injected into the preload store. They use omniauth which loads a popped browser window to handle the auth mechanism - once the user has authenticated it calls into a hook (window.opener.Discourse.authenticationComplete) to notify discourse that authentication has completed and sends the result. If the user successfully authenticated the browser is reloaded and because the user is authenticated the users JSON is loaded into the preload store. So, serving the index.html as a dynamic (is that still the right term? It sounds so ASP 3.0!!!) page is pretty much a must have. To do this we are going to need to drop the HTTP server provided by ember-cli and work out a way to push the /dist folder to another folder which can be part of a hosted project. I'm a big fan of ServiceStack but the hosted project could literally be any language/framework. Rebuilding the project on changes can be done using the ember build --watch command. What this will do is - every time you edit some code in the ember-cli project - ember will notice the files have changed and re-build the code - it then copies the resulting build to the /dist folder. Bower's symlink will then copy the code to the integration project. So now we get the mixture of serverside code inside the ember-cli index.html and we can inject in session state and preloaded data! This means I can go back to my header spike project and replace all of the stubbed code with real user data and start to really figure out the auth aspects of this refactoring. 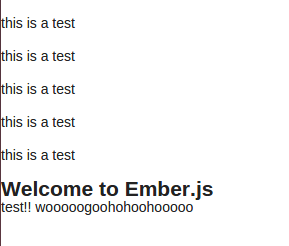 The "this is a test" lines are coming from the cshtml and the ember app is booted below it! All I need to do now is get the authed user from ServiceStack and serialize whatever data we need in the UI into the preload store. I've been playing about with Docker and Vagrant a lot recently, I find them to be really amazing tools. Obviously with the amount of OS envy streaming out of my little foray with Docker in particular I am trying to move the Sonatribe API over to run on Mono inside a docker container. If anyone has any help or pointers on these i'd be massively grateful! Following on from part 1 (CQRS Journey) this is my implementation spike using GetEventStore. Assesing which CQRS setup we should use at sonatribe for the new conversations feature. This implementation is quite a bit different so I'll discuss where they branch off from each other and maybe try and figure out the pros and cons. Using EventStore as the persistence mechanism for storing event streams takes a lot of faff out of the process. For instance if you don't want to you don't need to have any service bus sitting between the API -> domain service and read model. However - EventStore is a more lower level technology and because of that you don't get so much out of the box as you do with CQRS Journey. With this implementation I decided to keep the domain service in a separate process at the other end of a RabbitMQ queue. So - looking at the API you won't see a huge amount of difference in terms of complexity (except maybe RMQ is heaps simpler to get up and running). Moving on from there I have a console app (as opposed to a worker role) running with TopShelf (for easy promotion to Windows Service when required). The code for this is here: https://github.com/wayne-o/ges-tryout/blob/master/src/Conversations.DomainService/Program.cs. Really simple way of wiring up the command handlers using Castle Windsor. Looking at the one and only command handler: https://github.com/wayne-o/ges-tryout/blob/master/src/Conversations/Commands/CreateNewConversationCommandHandler.cs you can see how easy it is to save an aggregate root into the event store using the GetEventStoreRepository. This was one area that the developer is left to figure out - finding this repository was a great help. You can see in the AR that when I create a new conversation it fires a new ConversationStarted event. This event is listened to in the read model. The wiring up for the read model you can see here: https://github.com/wayne-o/ges-tryout/blob/master/src/Ges.ReadModel/Program.cs. Again - there is some work to do here to turn the received events into something that can be worked with. There is also some (overly simple) code here to dispatch the events to the event handlers. Inside the event handlers I am denormalizing the data to a RavenDb read model. Aside from the added work of figuring out the event dispatcher I find the GES architecture much much simpler than the Azure based CQRS Journey code. There seems to be much less ceremony - even after I reduced it drastically in my refactoring of CQRS Journey. I haven't got any perf details for either implementation but Greg claims GES will natively handle 20,000 messages a second on a single node so I doubt perf is an issue for either implementation. Next up I'll be adding some real features using each of these infrastructures. I like to work from an emergent design BDD style approach so will be looking at which of these works best under a test 1st dev cycle.